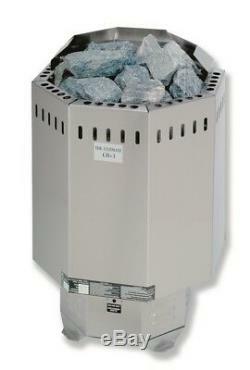 10.5 Kw Ultimate Commercial Sauna Heater - Stainless Steel with Digital Controller. The Saunacore Ultimate Commercial Sauna Heater was designed for sauna rooms that are primarily used for commercial use with larger volume's of space to be heated. This heater is meant for heavy-duty use such as a fitness club or hotel, while being able to provide years of reliable service. This floor-mounted unit has extra venting for proper air flow. It is made of a triple walled stainless steel body that ensures the surface stays cool. Saunacore sauna heaters are considered one of the most reliable and efficient heaters in the world. They are manufactured in North America under UL/CSA standards and backed by one of the best warranties in the business. Heat deflector surrounding rock tray directs heat into sauna, whereas others heat directly upwards over heater. Precisely engineered baffled shell construction provides enhanced air flow for quicker heat-up time. Ultra long-life industrial incoloy silver solder heating elements that are more durable than copper or stainless steel elements. Triple wall stainless-steel construction for lower surface temperatures. Extremely well ventilated body construction can allow heater run up to 50 degrees cooler than other comparable sauna heaters. Cold air at floor level is sucked up from the open underside of the heater and flows through the hot rock compartment, creating the air convection method in motion throughout sauna. Deep, large capacity stone compartment with adjustable 3-level stone tray holds up to 280lbs of stones. Built-in high temperature safety cut-off switch. 100% Surgical Stainless Steel (304 grade) construction, including shell, inner baffles, frame and rock tray. VOLTS / PHASE / AMPS. 240 / 1 / 37.5. 240 / 1 / 43.8. 240 / 1 / 50.0. 208 / 3 / 41.8. 208 / 3 / 50.0. 208 / 3 / 58.4. Comes with External Mount Mercuri Digital Controller. Available in 208 VAC 3 Phase at no additional cost. 21"W x 34"H x 21D. Comes with special sauna rocks. Industrial low density silver soldered. Max room size 525 cubic feet. The item "Ultimate Commercial Sauna Heater 10.5 Kw Floor Mount Sauna Stove" is in sale since Saturday, December 19, 2015. This item is in the category "Home & Garden\Yard, Garden & Outdoor Living\Pools & Spas\Spas & Hot Tubs". The seller is "sauna-heaters" and is located in Winnipeg, Manitoba. This item can be shipped to United States, Canada.